5 Lilies Native to the Northeastern U.S.
Folks who aren't especially "woodsy" may not be aware of the native lilies of the regions where they live. As an example, take residents of the Northeastern U.S., as well as nearby states and Canadian provinces. If they're not in the habit of hiking through their area's forests and meadows, they may think of exotics such as Easter lily or Stargazer when they hear "lily." That's too bad. There are some exquisite flowers in the Liliaceae family indigenous to areas such as my own stomping grounds, New England. Consider the flowers introduced below if you live in the region and wish to try your hand at landscaping with native plants. Chances are there's a nursery not too far from where you live that specializes in selling natives, and they may well carry one or more of these lovely native lilies. 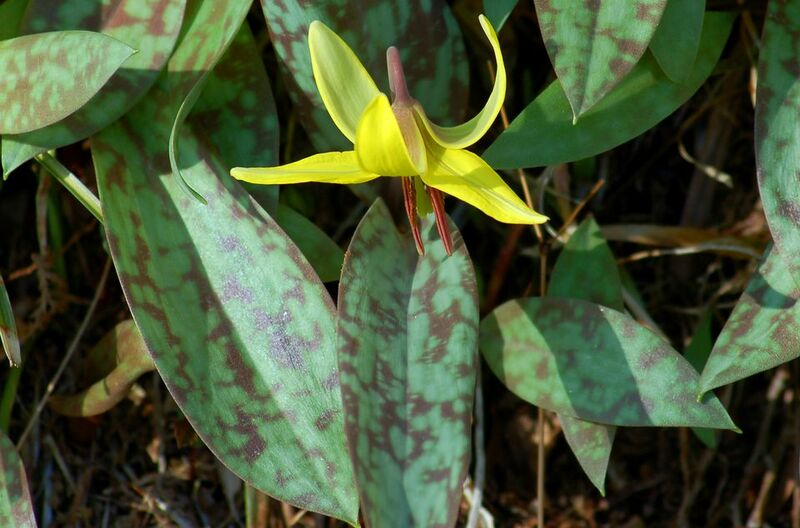 Trout lily (pictured above) is so-called for the appearance of its mottled basal leaves, whose shape and spots are reminiscent of the fish known as the speckled trout or speckled brook trout (Salvelinus fontinalis). It is an herbaceous perennial suitable for cultivation in growing zones 3-8. A small plant, trout lily reaches, at most, just a half foot in height, with a similar spread. In the wild, it grows in deciduous forests or at the edges of the woods, in areas where the ground is moist. Its wild habitat naturally suggests it as a candidate for woodland gardens in the landscape. This is a spring ephemeral that blooms in April or May -- and thereafter hastily departs into dormancy for the summer. Its solitary, nodding flower is yellow. Like Mayapple (, fertile plants produce two leaves, while sterile plants bear but a single leaf. Trout lily is a good choice for planting under deciduous trees. The ground in such "shade gardens" will not be in full shade till summer, which means that trout lily will receive the modicum of sunlight it requires during the spring. Because it likes damp ground, it's also a good wet area plant. For optimal growth, select a site with an acidic soil pH and with plentiful humus. Trout lilies grow from corms, the stolons from which allow the plants to spread and form colonies. Note this ability helps them to naturalize, in case you wish to grow them but live outside of the regions to which they are native. Although they are not of the same genus, when I spot trout lily while hiking through the woods of New England, I naturally think of bluebead lily, as well. Both have basal leaves, their nodding flowers are superficially similar, the plants can spread to form large colonies over time, and they can often be found growing in the same places: damp, acidic, wooded areas. It's not difficult to identify bluebead lily, though, and distinguish it from its fellow native lily. Bluebead lily (zones 3-7) is a slightly bigger plant (up to 12 inches or taller), it has more leaves (up to 5), the leaves are not speckled, and its flowers aren't solitary (3-6 flowers bloom in a bunch). It also blooms later in the spring than trout lily, so grow both if you're planning a sequence of bloom for your shade garden and need to have something in flower in both mid-spring and late spring. Moreover, bluebead lily can boast of an aesthetic feature that trout lily cannot: it bears attractive berries. The eponymous berries ("beads") are true-blue in color; although pretty, they are poisonous. When a sufficiently large number of these herbaceous perennials are present, the berry display can be quite impressive (especially against a light background). From small, yellow native lilies, I move to larger, typically orange ones with the final three entries, all of which display the whorled-leaf pattern on their stalks characteristic of plants in the Lilium genus (the so-called "true lilies"). Although I've referred to them above as orange (out of convenience), the speckled flowers actually come in a color range from yellow to orange to red. All three are summer bloomers that can be grown in full sun to partial shade. Canada lily (zones 3-9) has nodding flowers and attains a height of 2-4 feet. It can bear either a solitary flower or numerous blooms; the University of Vermont suggests "16-20 at most" as the upper end of the spectrum. It is a bulb plant that can spread by underground runners to form colonies if conditions are right (it prefers wet ground). Turk's cap lily (zones 5-8) bears some resemblance to the better-known tiger lily (Lilium lancifolium, sometimes alternatively called Lilium tigrinum). But whereas the latter is exotic (hailing from Asia), Turk's cap is a native lily in the Northeast, and it's another stoloniferous bulb that can spread over time. According to Newcomb's Wildflower Guide (p.352), it reaches a height of 3-8 feet, although the ones I've encountered fell on the lower end of that spectrum. Turk's cap lily inhabits wet meadows in the wild. Each plant can produce numerous flowers, which nod to the ground. Michigan lily (Lilium michiganense) is a similar plant, but native to the Midwest. The wood lily (zones 4-7) is something of an oddball in this group. Yes, the flowers from this bulb plant exhibit the same color range as the others (yellow-orange-red; mainly orange), but its flowers do not nod. It's also the runt of the group, sometimes achieving a height of just 1 foot (and at most 3 feet). And whereas the other two native lilies like wet ground, this plant colonizes drier soils. The stalks of some plants carry but a single flower, while others can bear up to five. Incidentally, another orange flower sometimes referred to casually as a "lily," namely, the common daylily (Hemerocallis fulva), is not native to North America (it hails from Eurasia). Like Stella de Oro, it is not even a member of the lily family, belonging instead to the Xanthorrhoeaceae, as does red hot poker plant. "Native Plants" and "Wildflowers": Do They Mean the Same Thing? In a word, no. "Native plants" refers to the place of origin, whereas "wildflowers" (or "wild plants") indicates only that the plants in question can be found growing in places where they are not tended by human beings. The native lilies discussed above are assumed to have been pre-Columbian denizens of the Northeastern U.S. Many wildflowers growing in the region, by contrast, originated elsewhere.